Publisher: Viking ISBN 13: 9780670876457. Author: Peter Robinson ISBN 10: 0670876453. Title: Dead Right Item Condition: used item in a very good condition. Will be clean, not soiled or stained. Books will be free of page markings. Publisher: Macmillan ISBN 13: 9780333907436. Author: Peter Robinson ISBN 10: 0333907434. Will be clean, not soiled or stained. This is first edition first printing (with 1 to 5 count on the publisher's page) of the thirteenth novel in the Inspector Banks series. Published by McClelland and Stewart of Toronto in 2003. SIGNED by the author on the title page. Up for sale is a brand new condition hardcover book all the colors of the darkness by peter Robinson. Book is from a private collection and comes with the dust cover in mint condition. I will ship 1 day after payment received. Happy bidding Customer satisfaction is my highest priority so bid with confidence. If you have a question pls message me and I will respond asap. Feedback is always appreciated. Publisher: Hodder & Stoughton ISBN 13: 9781444704877. Title: Watching the Dark: DCI Banks 20 Item Condition: used item in a very good condition. Will be clean, not soiled or stained. Up for sale is a brand new condition hardcover book piece of my heart by peter Robinson . Book is from a private collection and comes with the dust cover in mint condition. I will ship 1 day after payment received. Happy bidding Customer satisfaction is my highest priority so bid with confidence. If you have a question pls message me and I will respond asap. Feedback is always appreciated. Title: Cold is the Grave: Cold is the Grave Vol. 2 (The Inspector Banks series) Item Condition: used item in a very good condition. Author: Peter Robinson ISBN 10: 0333901916. Will be clean, not soiled or stained. Publisher: Hodder & Stoughton ISBN 13: 9781444704839. Title: Before the Poison Item Condition: used item in a very good condition. Will be clean, not soiled or stained. Published On: 2011-08-01 SKU: 7719-9781444704839. Publisher: Pan MacMillan ISBN 13: 9781405021111. 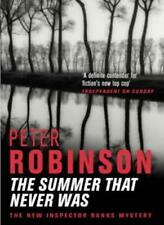 Author: Peter Robinson ISBN 10: 140502111X. Title: Not Safe After Dark Item Condition: used item in a very good condition. Will be clean, not soiled or stained. SIGNED by the author on the title page. Published by McClelland & Stewart of Toronto in 2007. In near fine / near fine condition. Peter Robinson's Mystery thriller "All the Colors of Darkness" was published as hardcover with dust jacket by Morrow c2009 (978-0-06-136293-4). Book is a stated 1st Edition, 1st Printing, in Like New condition: no obvious faults or issues. Publisher: Hodder & Stoughton ISBN 13: 9780340836927. Title: All the Colours of Darkness Item Condition: used item in a very good condition. Author: Peter Robinson ISBN 10: 034083692X. Books will be free of page markings. Publisher: Macmillan Publishers Limited ISBN 13: 9780333907412. Author: Peter Robinson ISBN 10: 0333907418. Publisher: Hodder & Stoughton, UK ISBN 13: 9780340919514. Author: Peter Robinson ISBN 10: 0340919515. Title: The Price of Love Item Condition: used item in a very good condition. Edition: 1st List Price: -. I greatly appreciate your stopping by. This is first edition first printing (with 1 to 5 count on the publisher's page) of the fourteenth novel in the Inspector Banks series. Published by McClelland and Stewart of Toronto in 2004. SIGNED by the author on the title page. Publisher: Hodder & Stoughton ISBN 13: 9780340836903. Author: Peter Robinson ISBN 10: 0340836903. Title: FRIEND OF THE DEVIL Item Condition: used item in a very good condition. Books will be free of page markings. This is first edition first printing (with 1 to 10 count on the publisher's page) of the eleventh novel in the Inspector Banks series. Published by Viking of Toronto in 2000. SIGNED by the author on the title page. SIGNED first edition. First printing in Canada. No remainder marks. Not price clipped. Appears unread. First edition first printing of the fifteenth novel in the Inspector Banks series. SIGNED by the author on the title page. Published in 2005 by McClelland & Stewart of Toronto. In fine / fine unread condition. Peter Robinson's DCI Banks is now a major ITV1 drama starring Stephen Tompkinson (Wild at Heart, Ballykissangel) as Inspector Banks, and Andrea Lowe (The Bill, Murphy's Law) as DI Annie Cabbot. This was Peter's sixth Arthur Ellis award. By Peter Robinson. PLAYING WITH FIRE. This book is unread and in very good to like new condition. It is tightly bound with a straight spine and clean white pages. The orange composition cover has the slightest of imperfections. This is a first edition first printing ( with 10 to 1 count on publishing page ) of the fourth novel in the Inspector Banks series. SIGNED by the author on the title page. Published by Viking of Toronto in 1989. This is a first Canadian edition first printing ( 1 2 3 4 5 on the copyright page ) of the seventeenth novel in the Chief Inspector Banks series. SIGNED by the author on the title page at the 2013 Malice Domestic in Bethesda. Published by McClelland & Stewart of Toronto in 2007. In new / new unread condition. I will combine shipping for two or more items. Thank you. This is first edition first printing (with 1 to 5 count on the publisher's page) of the nineteenth novel in the Inspector Banks series. Published by McClelland and Stewart of Toronto in 2010. SIGNED by the author on the title page. First edition first printing of the fifth novel in the Inspector Banks series. SIGNED by the author on the title page. Published in 1991 by Viking of Toronto. There is a good amount edge wear, both the Canadian and UK prices are still intact. 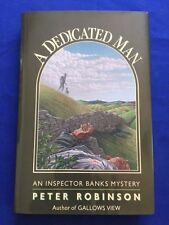 This is a first edition first printing ( with First Published in Great Britain 1995 on the publisher's page as it should be with no later dates ) of the seventh Inspector Banks mystery. Released in the US and Canada under the title Final Account. Title: Sleeping in the Ground: DCI Banks 24 Item Condition: used item in a very good condition. Publisher: Hodder & Stoughton ISBN 13: 9781444786910. Will be clean, not soiled or stained. First edition first printing (with 1 count on the publisher's page) of the nineteenth novel in the Inspector Banks series. SIGNED by the author on the title page. The book is published by Hodder & Stoughton of London in 2010 and is in fine / fine unread condition. A DEDICATED MAN. ". Viking Press. Markham (1988) First edition. SIGNED by Peter Robinson on title page. About fine in fine dj. (2 tiny soil spots at top edge) SECOND Inspector Banks mystery.